Getting a tattoo in a language you don't understand is an important step in every millennial's life. But, you have to be wary. While you think that a particular phrase is inspirational when translated to English, it could mean something entirely different in the original language. Pop star Ariana Grande is the latest to fall into this trap. 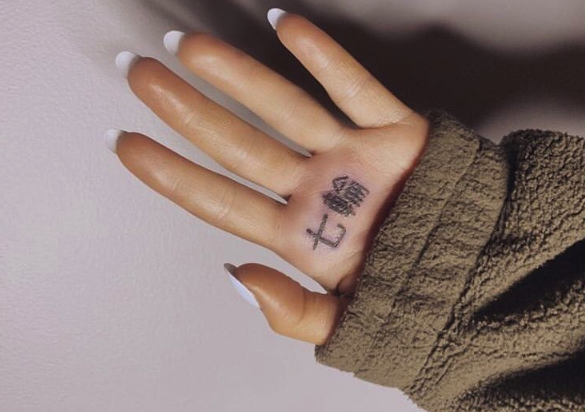 She took to Instagram last night to reveal a photo of her new palm tattoo, which was supposed to say "7 Rings" in Japanese. But when some of her Japanese fans saw the tattoo they were horrified, because it actually says "shichirin" which is a small Japanese barbecue grill. Ariana quickly removed the photo, but not before fans had taken plenty of screenshots. There were also plenty of people of people informing her of the mistake in the comments of the post. "[the tattoo] means 'portable clay cooking stove' in Japanese," one user pointed out. "Not 7 rings"
Another added: "Noooo don't do that, DON'T DO THAT," pointing out the mistake once again. One fan explained: "When we translate in English directly, it means 'seven rings.' BUT!! In Japan, the word is used for a portable clay stove." What an embarrassing mistake. After the post was deleted, people took to Twitter to continue the conversation. Ariana replied to one fan, saying that she cut her tattoo session out of pain, and explaining that the tattoo wasn't meant to last. "I wouldn't have lasted one more symbol," she said. "But this spot also peels a ton and won't last so if I miss it enough, i'll suffer through the whole thing next time." This isn't the first tattoo mistake the 25-year-old has made. 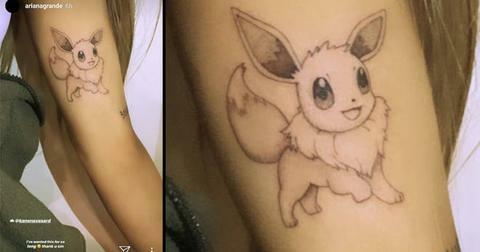 Ariana got a number of tattoos with her now ex-fiance Pete Davidson. One of which has late father, Scott Davidson's, firefighter badge number, 8418. 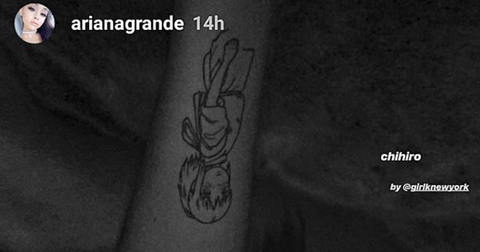 Ariana has since revealed that she has gotten rid of the tattoo, and replaced it with a homage to the dog Grande shared with the late Mac Miller. The singer-songwriter also has a Pokémon and Spirited Away tattoo, which we're far more supportive of. Because who doesn't love Eevee? At least this one shouldn't last too long.